It's November, so I'm excited about the holiday pieces that come out during this time. Torrid also has some great gifts listed in their holiday catalog including a new fragrance coming out on 11/17. It smells lovely, like a light powdery/floral scent. I am also super excited to shop for holiday clothes, I tend to gravitate towards colors: red, cream, and gold. Anything sparkly or with sequins are a must as well. Torrid just released pieces from their holiday look-book. 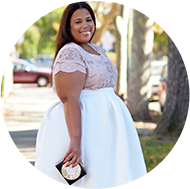 I actually got my mailer (with coupons) on Saturday and partnered with Torrid to style a few looks from the look-book. This isn't my usual one piece three ways, but I did use the cropped convertible jacket in two looks. It's my favorite piece from the collection. The jacket can be worn as a blazer, then you can zip off the bottom and wear it as a cropped jacket. Genius!! I love that I'm starting to see convertible pieces in plus. It allows you to get more bang for your buck. Now, let's get into these looks. Before 5pm office party: I really loved this look. My thought was that this would be a great look for those holiday parties in the office that begin before 5pm. So you still have to work (and I use that term loosely, lol) for the first half of the day, then the rest of the day you are partying. This is a way for you to look festive and office appropriate, and to be comfortable. I know I blog full time, but I do remember what it was like to work a 9-5. Style Notes: I love love love these pants. They are high-waisted and give your body nice lines. They have stretch and I got them in a Torrid size 4. The shell I'm wearing is tucked in, but is long and flowy and can be worn untucked. I got the shell in a 3 to cover the hips. I got the cropped jacket in a 3. This is pretty true to size, so I should have gotten a 2. The jacket is made from a ponte knit material and does contain stretch. After 5pm office party: I put together this look for those of you that have the after 5pm holiday parties. I love fall because I wear tights, and wear dresses that are a little shorter, but still have that coverage on my legs. I love wearing red and this color is often hard to find unless it's around the holidays, so I'm always sure to grab some sort of red dress during this time. I paired with the cream convertible jacket for the arm coverage you may want, especially when you are with the office folk. Style Notes: I got this dress in a 22 and it fits like a cover. It does have stretch. Holiday Weekend Break: You've been fancy this week and will definitely want to slip into something comfortable. I chose these leopard pants with the relaxed fit and paired with the "lips" sweater. Style Notes: The lips sweater is a size 3. I sized up for an oversized look. I would normally do a 2. The pants are a size 5. I do have some of these pants in a 4, but there is no stretch and I sized up for extra legroom. There is a drawstring to tighten the waist a little if you need it. This post was sponsored by Torrid, all opinions and clothing styling is 100% my own.